Following a conversation on Twitter, triggered by @twickerman, we wrote to ask Richmond Council why there’s a roadworks sign here. As Twickerman observed, it’s dangerous for cyclists, and it’s not even a particularly important notification, either. 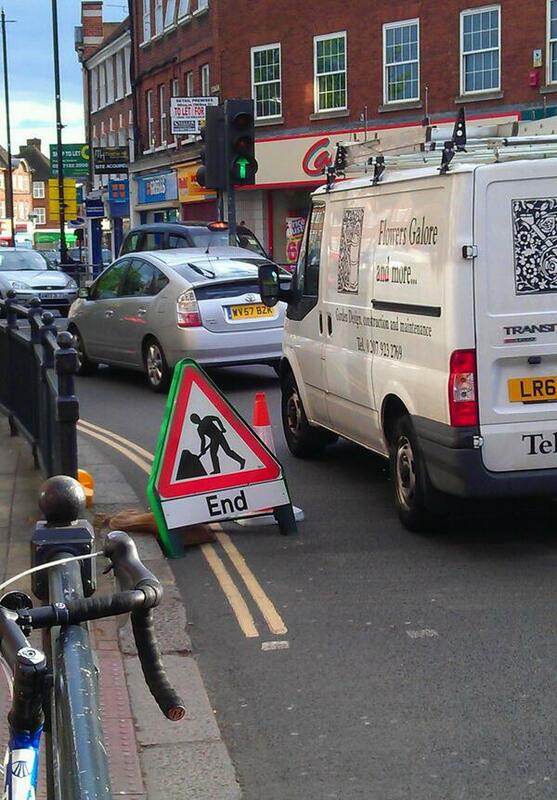 Thank you for your enquiry regarding the works currently ongoing in Twickenham Town Centre and in particular the Men at Work “End” sign.I will ask my Engineer to inspect the works to ensure it is correct and appropriately placed. Unfortunately, removal of this sign is not possible as road works have to be signed and guarded to an acceptable level (Traffic Signs manual Chapter 8), failure to comply could lead to prosecution.I trust this answers your enquiry but please do not hesitate to contact me should you require any further information regarding these works. To be honest, we didn’t think this particularly satisfactory. Given how much traffic can be pushed through this area at peak times, it seems woefully inappropriate to place signs like this. So we’ve written back to them, asking for some more details about what they normally do to ensure signs and appropriately placed (or at least more appropriately than this!). We’ll keep on at the council to find out what’s going on here: it seems madness that one can claim fear of prosecution for putting signs in places that make cycling more dangerous and unpleasant than it already is! And if you look at what happens in other countries, or even elsewhere in London, it isn’t impossible to think ahead and accommodate all road users when planning road works. 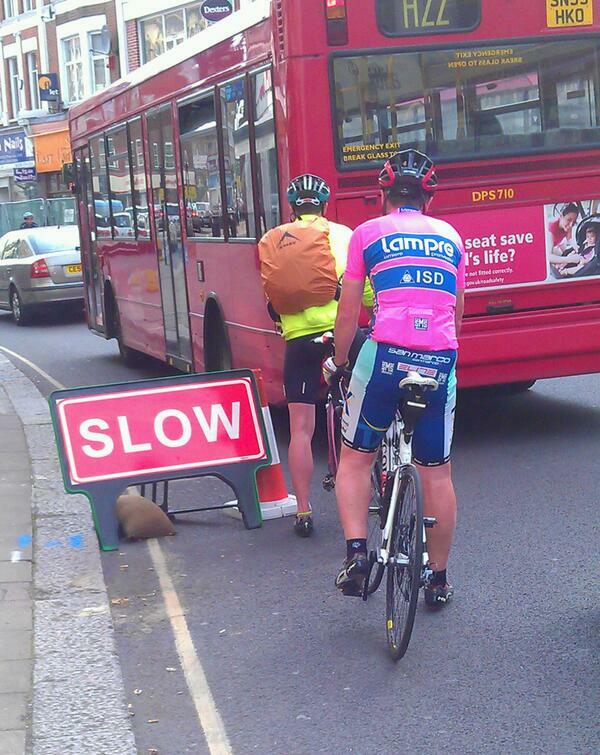 If you see something like this, let us know, and use Richmond Council’s fault reports page. The council has advised us over Twitter that the very poor signage in Twickenham will be fixed today, so credit to them for some fairly swift action. You can see the full thread on Twitter here. This entry was posted in Campaign and tagged Road Works by Campaigns. Bookmark the permalink.